I've just been watching a great TV programe about Chippendale furniture. Appearing on it was a gentleman who restores laquer work or japanning. I have been self taught , so I was relieved to see that I do the job in the same way as him...although I often use loose leaf as well as transfer...but one thing he uses which I never do..is cotton wool....he uses it to wipe off , but I find that any tiny trace of gilders size will pick up fluff from the cotton wool..... but he does his job everyday so probably doesn't have any stray gold size. Above shows damaged box and below is my restoration. The history of lacquer is over a thousand years old, originating in China. In the 1930's modern laquer techniques were very popular giving a shiny gloss surface. It is still used in Japan and all over the world. There are three main categories of laquer, the first is the' true' laquer then 'resin ' laquer and finally japanning or Japan work. Modern laquer paint is another variation of japanning being sprayed onto furniture to achieve a high gloss tough finish. New decoration for a frame . True laquer used the sap of specially cultivated trees. The sap has to be processed and coloured before its used and is very poisonous. It was built up in lots of layers onto thin wood creating a wonderful smooth surface. I think this was sometimes done on a boat because there is less dust. The artists that did the fancy gilding and decorating were never given the job of prep because they were needed....I know sounds an awful way of treating workers but that was the way it was. Resin Lacquer was made from the female of an insect related to the cochineal beetle. The insects fed on sap , were collected , crushed and heated slowly. After sieving ,the top clearest layer would be dried to form sheets that would be flaked and stored. Mixing with alcohol made a liquid that could be again built up in layers. It was used in Indian and Islamic laquer. 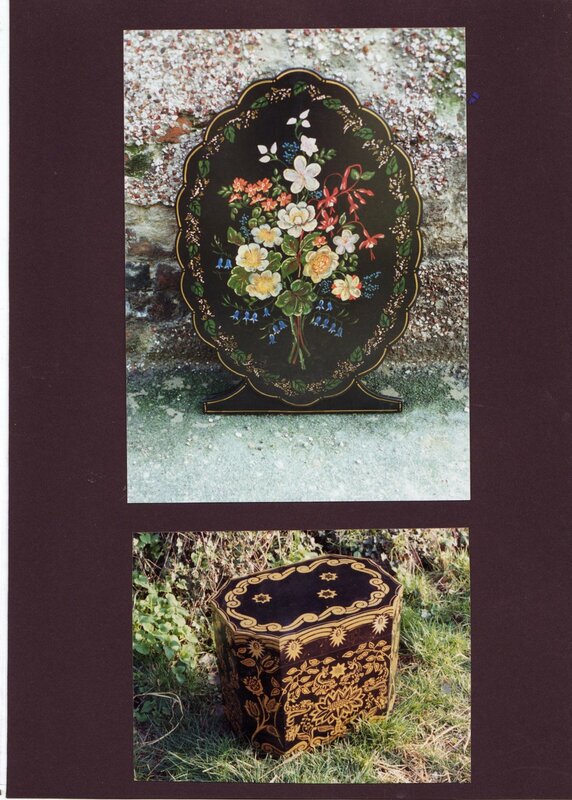 Top: New Victorian style firescreen. Below ; gilded box. My design is based on wallpaper in Brighton Pavillion. Japanning is the European substitute for oriental laquer, and was popular in the 1718th century. the wood or papier mache was built up with layers of shellac or varnish, even 20 or 30 coats ! The colours mostly used are black, red, green, blue and yellow. The raised designs were built up from gesso and then gilded. This is not as strong as the laquer base which is why so much chips off. 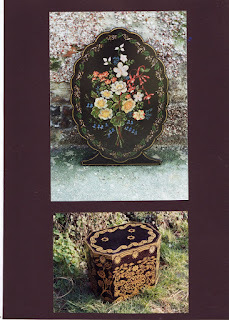 I used this technique when repairing, and nearly always aim for an old appearance, The Grandfather clock case had a new base and I designed a new decoration for the base, matching the original top and laquered it to match.